As soon as the promise of a Desta Ethiopian Kitchen opening at Emory Point hit the news, I texted my foodie friends out of sheer joy, scheduling future dates for the opening of the second location of one of Atlanta’s top Zagat-rated restaurants. Though the opening date was up in the air for much of 2018, I was prepared to fly from my hometown of Tampa, Fla., over the summer, just to be one of the first to see if it compared to the original location on Briarcliff Road. However, the elusive and much-anticipated restaurant remained behind closed doors until its prospective opening date in August 2018. 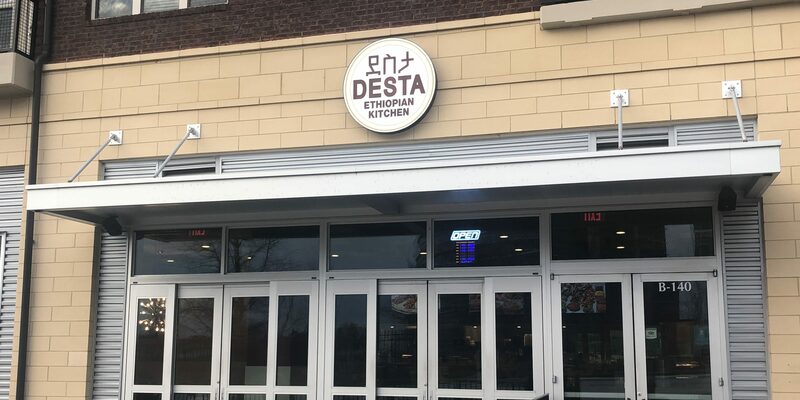 Desta’s Emory Point location finally opened its doors on Dec. 10. The second spot provided the familiar greatness of the original location, but with a more casual, fast-paced twist. 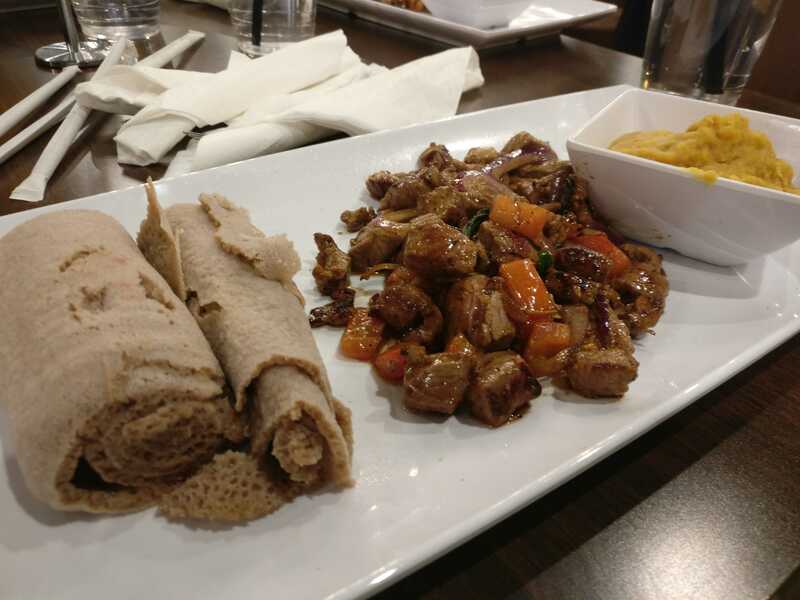 Known for the practice of eating with one’s hands (oftentimes from a communal bowl filled with various vegetable and meat side dishes), Ethiopian cuisine seems to boast a growing following among Atlantans. What separates Desta from other Ethiopian restaurants on the block is its willingness to offer guests a blend of an authentic Ethiopian meal and modernity. The menu shows dishes in their original Ethiopian names but includes an English glossary on the side. It’s a learning experience just as much as it is a gustatory journey. True to Ethiopian cuisine, each meal is served with injera, a sponge-like sourdough bread that is used to scoop food in place of utensils. One need only ask for utensils if one needs them, but one may receive a disapproving glance. Needless to say, I entered the establishment with high expectations. The first thing I noticed was the fast-food vibe, coming from the line of people in front of the cash register, TV screens, plastic cups with iced water waiting on the counter and a giant ceiling fan — in stark contrast to the homey feel of the Briarcliff location. But while the OG Desta boasts a rustic atmosphere, Emory Point Desta offers a quick Ethiopian fix amid your busy work life. After placing your order at the counter, you’re given a number that you can bring to any available table where your food will be served. The speedy service and convenient location rival the typical 30-plus-minute waits of the Briarcliff location, which takes no reservations. Upon recognizing that the Emory Point location had the same menu as the first location, I immediately ordered the lamb tibs — cubed pieces of meat sauteed in a delicious blend of spices, onions, tomatoes and peppers (which you can get on the side if you are weak) — with a side of ater — a Pikachu-yellow split pea stew. The first bite of lamb filled my mouth with the renowned secret Desta blend of spices and juicy meat. The injera, which soaks up the juices, complemented the tender meat with its light sponginess and tang. I like to alternate the injera between the lamb and the soul-soothing ater, a vegetarian favorite and an addicting combination that can also be ordered as an entree. The smooth, lentil-like texture of the Ethiopian stew provides an enjoyable respite from the chewy meat. One can’t help but feel a sense of camaraderie when eating with one’s hands with other people. The practice of scooping good food with squishy bread makes for a fun activity that you don’t come across every day in a society that encourages the use of a spoon and fork. Desta’s diners will likely bond as they struggle to shovel meat and veggies sloppily into their mouths with sauce running down their arms. At $12.75, the lamb tibs won’t break your bank. Given the hefty serving portion, I usually end up taking leftovers to-go, but I probably won’t eat there every day given that it’s quite a walk from main campus and they don’t accept Dooley Dollars. But the experience of enjoying a well-cooked, authentic Ethiopian meal? Priceless.